Accueil Médical d’Annecy offers every Thursday morning free medical consultation for people in need (asylum seekers, the homeless,…). 12 doctors currently participate. A nurse assists the doctor and takes care of the medical monitoring post consultation. The office is provided by the Conseil Général who also takes care of the prescriptions when necessary. 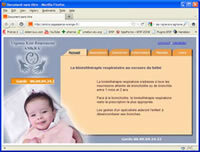 Conseil Général, Service des Actions de Santé. This association is part of the Alma France network, and helps to resolve issues of the mistreatment of the elderly. ALMA 74 listens to the elderly and their families as well as neighbours and professionals. It works in partnership with services, institutions, associations, medical professionals, social workers and legal institutions helping the elderly. Urgences Kiné Respi (AMKRA) is an association of 46 Physiotherapists on call in the Annecy region, every weekend apart from July and August. Réseau Bronchiolite 74 brings together the 9 respiratory physiotherapy associations on call in the Haute-Savoie department.